As with all amateur sporting organizations, the club’s cash flows and finances are very dependent on its members paying their membership and playing fees on time and in full. The club reserves the right to not select playing members whose fees are in arrears post Round 1. The club may consider special arrangements for payment of fees due to exceptional financial hardship on a case by case basis. See details of fees at the registration page. 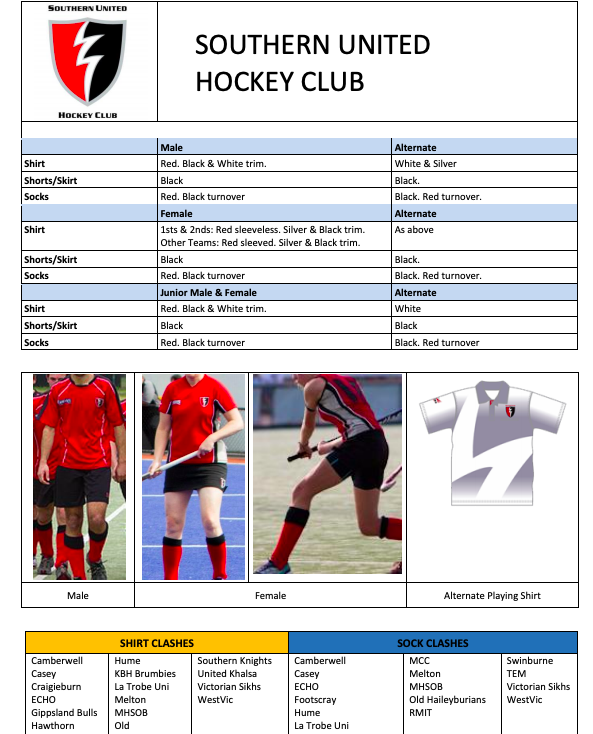 Players in junior under 16 Shield teams (A grade) must wear numbered playing tops. Numbers are allocated by the junior section and are available here. Players in Premier league/reserves and pennant women’s and men’s teams also must wear player numbers. Numbers for men are available here, and women here. ALL players are required to wear a mouth guard and shin guards at both games and training for safety reasons. The club will provide Goalkeeping gear for players who want to try out for that position. For career goalkeepers we suggest that they purchase a kit themselves. In junior games, ALL players defending in penalty corners MUST wear a face mask. The club provides four face masks per team for this purpose. Hockey Victoria have advised that players are not allowed to wear fitness monitors unless they are covered with a sweatband or tape. If not they will be regarded as watches and the players asked to remove them. Our club is run on volunteers and we are always looking for people to help out with the running of the club – whether at a committee level or someone to turn the sausages on the BBQ. It is very rewarding being able to help out and we urge you to see what you can do to put back into the club. If you are unable to help out on the day to day running of the club then you may have a service that you can offer – either way we would be happy to hear from you. For Volunteering please contact the relevant section leaders or if you have a product or service that you can offer to the club then contact Help offered. Each section has it’s own selection policy – please refer to each section for details. The SUHC uses the Hockey Victoria code of conduct and all players must agree to abiding by this when registering. The Southern United Hockey Club does not condone or accept the use of bad language, rough play or abusing of either other players or umpires. The club supports the pinciple of Sportsmanship and Fair Play. It is expected that players, coaches, parents and supporters recognise and encourage the contribution of its players and umpires in a correct manner. Abusive language, especially when directed towards officials cannot and will not be tolerated. For HV code of conduct please click here. Please ensure the injury has been reported on the team sheet if it occurred during a game. Please feel free to advise the Injury Officers below of your injury. Please note: As per emails sent to participants, the Hockey Equipe indoor competition @ Skateworld is NOT sanctioned by Hockey Victoria and the personal insurance above does not cover participants in this competition.